Task Bots handle the simple stuff, so your team can focus on the things only humans can do. Note: While some task bots work on the Intercom Platform, you’ll need specific Intercom products to access certain task bots. Task bots only gets involved in conversations when they knows they can help. These are designed to complement human conversations, not replace them. For example, task bots won’t interrupt when you’re talking to a user or keep asking questions to users who don’t engage. When a users asks a question in the Messenger, the article suggestions Task Bot will suggest relevant articles to help answer it. Note: You can access the article suggestions Task Bot if you have Articles, our knowledge base product. Article suggestions free up your support team to tackle more complex questions. You'll need to turn your Help Center on to use smart suggestions. Smart suggestions won’t appear until you have 10+ live articles in your Help Center. The smart suggestions Task Bot will only suggests articles when a user’s question contains more than 5 words and less than 30 words (note: it excludes words like ‘the’ and ‘a’). It won’t suggest articles to users who visited your Help Center in the past 15 minutes; as we presume they've already looked for the answer in the Help Center. If a user clicks ‘Yes’, it will automatically close the conversation, so it never reaches your open conversations list. Note: Whenever a teammate replies to a conversation, it's automatically assigned to them; the article suggestions Task Bot will no longer contribute to the conversation. Your Articles Insights show you how many articles the smart suggestions task bot has successfully resolved for users. When a user reacts negatively to an article, the article feedback Task Bot follows up by asking for feedback, so your team can resolve their issue. Note: This reply comes from the article feedback Task Bot, rather than a teammate. It can’t be customized. The reply time Task Bot tells customers when your team is likely to reply. Your reply time appears when a lead or user asks a question. When a user or lead asks a question outside office hours, it lets people know when you’ll be back. Note: If you haven’t done so already, set your office hours and reply time now. Operator's contact details Task Bot asks new leads for their email and /or SMS, so your team can contact them if they leave the Messenger. The Qualify Leads Task Bot qualifies inbound leads for your sales team, by asking for up to four pieces of qualification data. You can also create separate qualification paths for different types of inbound leads. After you close a conversation with a customer, the conversation ratings Task Bot will ask that customer to rate their experience. This helps you measure your support performance. Note: Conversation ratings are available with Inbox Pro. The GitHub updates Task Bot notifies you when a GitHub issue related to a conversation is opened, updated or resolved, so you can follow up with the customer. Important: To get GitHub updates in the Inbox prodc connect to the GitHub app. 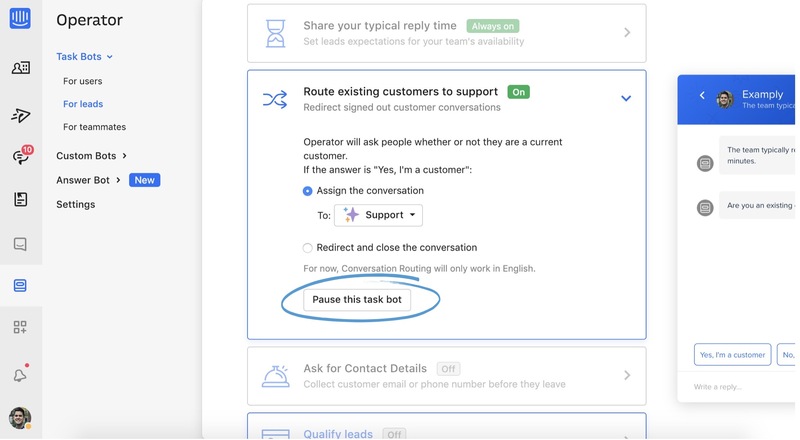 When a new lead starts a conversation in the Messenger, the Conversation Routing Task Bot asks if they're new leads or customers, so it can route them to the right team. If they answer 'Yes, I'm a customer', the Conversation Routing Task Bot will route them to a team of your choice. If they answer 'No, I'm not a customer yet, the Qualify Leads Task Bot will step in and qualify them by asking for up to four pieces of data. The Qualify Leads Task Bot will then add their qualification data to their profile, so you can easily check this info when you're chatting to them in the inbox. 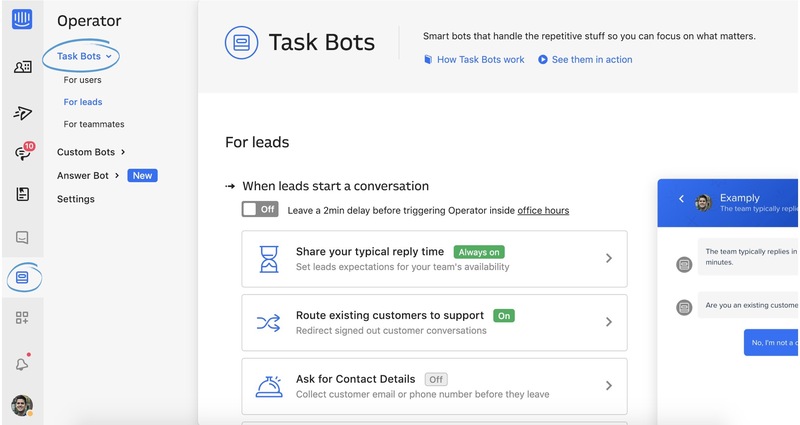 You can also use this to Task Bot to follow up with qualified leads by assigning them to a specific team, adding them to Salesforce, send a book a meeting and more. If you haven’t already, make sure to set your office hours and reply time now. Ensure you're capturing the right qualification data from your leads. Turn on the conversation ratings Task Bot to start gathering customer feedback at scale. Did you know you can proactively engage visitors with Custom Bots? Start converting 36% more leads in minutes!